Consider what you need to give yourself a real jolt of focus, energy, and enthusiasm. What makes the most sense for you based on how you usually wake up – reflective, jubilant, morose, anxious, physically keyed up or worn out? Do you need to calm your mind, clear it out, or give it a jump start? Would you benefit from taking stock, wringing out stress, or asking for guidance and support? What do you need to make your day one for winning, not dragging yourself through or racing to an artificial finish line? Consider what you might want to include in your Morning Workshop. Here are some suggestions of things that work well. There are also additional suggestions in the blog post on self-care. I’d like to share what I am currently doing each morning to help give you an idea of what this could look like. My current Workshop centers on the mental and spiritual (and breathing) to help me calm and focus; I save my physical exercise for later in the day. Yours will look different, depending on what your needs are. Don’t be afraid to mix it up as your needs shift, but be consistent with doing something every day. Light a candle, focus on my breath, and meditate – 10 mins. Speak a spiritual treatment (a form of affirmative prayer) – 3 mins. 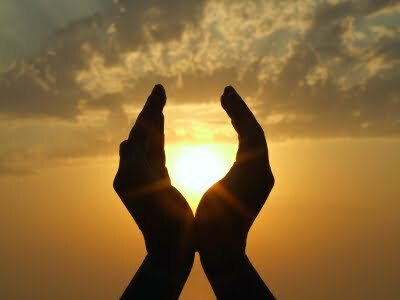 Gratitude practice (“I am grateful for X, Y, Z”) – 1 min. Speak my current affirmations while breathing deeply – 2 mins. 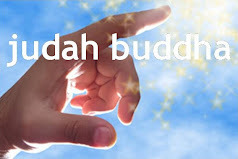 Set my intention for the day (“My intention today is to be [calm, patient, focused, forgiving, etc. ]”) – 30 secs. Speak my closing thought (“I love what is. Today, amazing things will happen.”) – 10 secs. One final deep breath – 10 secs. Remember, you can (and should) change it up as needed. The main thing to remember is to honor yourself by committing a little time each day to doing it – even if you only have 5 minutes to get present to yourself and your day before diving in. But try to be consistent by doing it at a similar time each morning, and every morning. I can promise that after the first couple of weeks of consistently practicing this, you’ll start finding yourself more calm and focused -- not only at the start but more often throughout the day. A fabulous DailyOM post on prayer and meditation: "Put very simply, prayer is when we ask the universe for something, and meditation is when we stop and listen." "Growth means change and change involves risk, stepping from the known to the unknown." 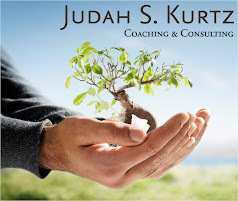 Since 2000, Judah Kurtz has provided coaching and consulting to a diverse range of individuals and organizations throughout the United States. With energy and humor, Judah empowers his clients to uncover their hidden potential and barriers to success, and learn to consciously design their lives and businesses with greater freedom and purpose. They develop a deeper understanding of who they are, what they stand for, what they want, and how to get it.